One civilian was killed and three police officers injured after shots were fired at a cafe in Copenhagen during a free speech discussion attended by controversial artist Lars Vilks and the French ambassador to Denmark, according to Danish police. The meeting, “Art, Blasphemy and Freedom of Expression” was being held in the Krudttonden cultural center in northern Copenhagen. The French ambassador François Zimeray had just finished speaking at the event as the shots were fired at around 14:30 GMT. Later he confirmed in a tweet he was unharmed. Some 30 bullet holes were found at the site. The perpetrator fled the crime scene in a dark Volkswagen Polo that was located later in the east of Copenhagen. 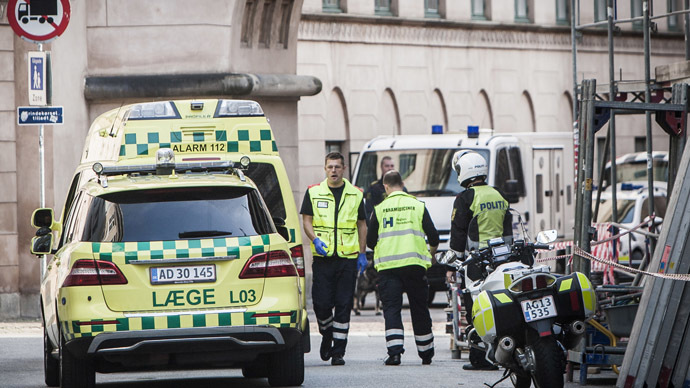 According to the Berlingske newspaper, one spectator was seriously wounded while three police officers sustained light injuries. Police confirmed the 40-year-old civilian later died. As part of a manhunt for the shooter, police are carrying out searches at the Denmark borders with Germany and Sweden. Though Danish police said they aren’t sure if the shooting was a “terrorist attack,” they are investigating it as one. Danish security forces meanwhile have said that incident was likely a terror attack. This was later backed Prime minister Helle Thorning-Schmidt. "We feel certain now that it was a politically motivated attack, and thereby it was a terrorist attack," she told reporters close to the site of the shooting, in which one civilian was killed and three policemen were wounded. "We are on high alert all over the country." French President Francois Hollande has also condemned the attack and expressed solidarity with Danish Prime Minister Helle Thorning-Schmidt. He also announced that French Interior Minister Interior Minister Bernard Cazeneuve would go to Copenhagen as soon as possible. "I saw one of them running by, wearing a mask. There was no way to tell his face. I'm not even sure if there was one or two," she said. “I heard someone firing with an automatic weapons and someone shouting. Police returned the fire and I hid behind the bar. I felt surreal, like in a movie,” Niels Ivar Larsen, one of the speakers at the event, also told the TV2 channel. In 2007, Lars Vilks drew a cartoon depicting the prophet Muhammad as a dog. Subsequently, the controversial 68-year-old artist has lived under heavy security and now travels with police protection when in Denmark. Previous year, a Pennsylvania woman last year got a 10-year prison term for a plot to kill Vilks. In 2010, two brothers tried to burn down his house in southern Sweden; they were jailed for attempted arson. Vilks hopes Sweden's SAPO security service, which deploys bodyguards to protect him, will step up the security around him. Though many Muslims expressed disgust at the devastating Charlie Hebdo massacre, many admitted to being deeply offended by the magazines Muhammad cartoons. The latest attack in Denmark comes after weeks of terror fears in Europe in the wake of the January 7 murders at the office of French satirical magazine Charlie Hebdo and the attack on a kosher shop that killed 17 people. The attacks provoked massive public response in France and across the EU. Two million people joined a rally in Paris on January 10-11, and up to 3.7 million gathered across France to honor the victims. Newspapers and magazines reprinted some of Charlie Hebdo’s cartoons. A German tabloid in Hamburg was attacked with an incendiary device on January 11, following the move. Just over a week after the French terror attacks, Belgian police killed two men in a fierce gunfight in the eastern town of Verviers. The firefight erupted in one of 10 raids against Islamist extremists who had been under surveillance after returning from fighting in Syria.